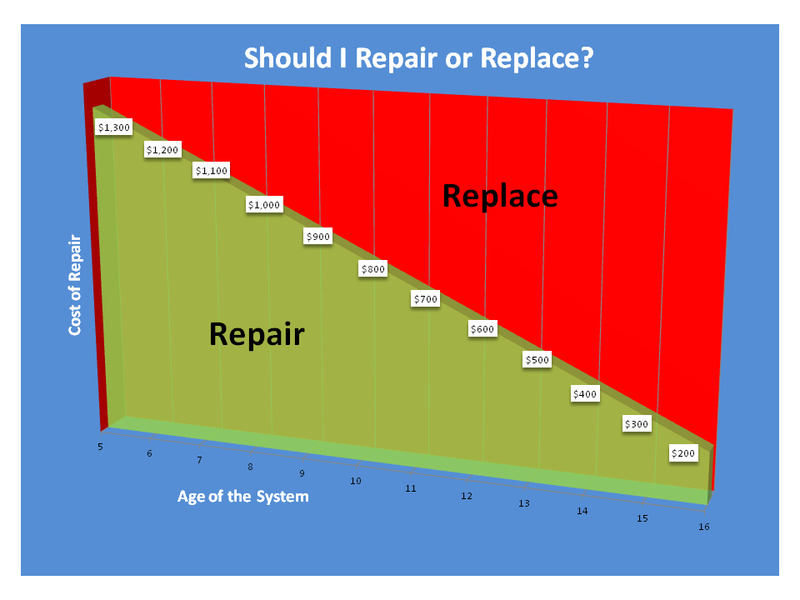 If you have a standing pilot furnace or an air conditioner that is built before 1992, it's time to consider replacement, even if you're not facing a repair. The reality is that your furnace is around 65% efficient and your air conditioner is 8 SEER or less. The amount you can save in utility costs will help pay for the cost of a new unit and it's not a matter of if, but when you will find yourself facing a costly repair. Take the time now to research and plan for replacing your unit so you have the time to make an educated decision instead of being rushed because you don't have heating or cooling. So those situations are almost always going to be a "Replace" recommendation, but what about when it's not so obvious? Follow one of the many rules of thumb to determine if repairing or replacing makes the most sense for you. Consider replacement if the equipment is beyond three-quarters of its life expectancy and repairs will cost more than a third of replacement. So, if your furnace is 15 years old and you're facing a $750 repair, you should probably replace the unit. Keep in mind that you can also take this opportunity to improve your home comfort and lower your utility bills - in other words, don't just settle with Single stage 80% furnace and be done with it - consider things like multiple staging, 95% efficiency, and variable speed blowers to maximize your savings and your comfort. Below is a chart that oversimplifies things a little bit, but gives you an idea of what you can expect. The best option is to have a highly trained and qualified technician give you an honest assessment of your equipment. Some 10 year old equipment needs to be replaced due to lack of maintenance or a poor quality installation. Some 20 year old equipment looks and works like new because it's been well maintained. A technician knows what to look for and what they're looking at. If you live in a beautiful newer home but are still stuck with builder's quality HVAC equipment which has made your home uncomfortable and your utility bills higher than they needed, it might be time to replace your equipment, even if it does have some life left to it. Every situation is different, everyone's needs are different. Let us help you determine what makes the most sense for your situation. Some other considerations to help with your decision include knowing how much you could potentially save by replacing your older, less efficient equipment with new high efficiency heating and air conditioning. One tool for that is http://www.hvacopcost.com/ where you can plug in the age, size, and efficiency of your existing equipment, where you live, and what you might replace it with. Try it yourself, you might be surprised by how much you can save. At the end of the day, repairing or replacing your HVAC equipment is a decision that only you can make based on your financial, comfort, and environmental needs. If you're not sure what's right, maybe you would like a free in-home analysis and estimate of your existing HVAC equipment. Give us a call or drop us a line if you have any questions.